Get ready to pucker up! 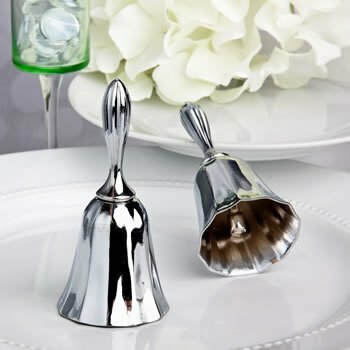 These beautiful kissing bells will be ringing at your reception! A great addition to your reception tables, these silver-plated wedding bells stand about 4" tall and come in an individual white gift box for presentation. Hi, the material of the bells are metal or plastic? Ca you personalize the Small Silver-Plated Bell in Gift Box? I'm sorry, that item does not offer any personalization options. Can the bells be personalized? Engraved? Unfortunately, the Small Silver-Plated Bell in Gift Box can't be personalized. We're unable to alter this item at all from how they're described/shown on our site since they're shipped directly from the manufacturer.